Stress is something that we deal with on a daily basis, that’s not a secret. What is a secret is that a lot of the stress that people build up is the secrets we hide from others. Yes even you who’s reading this is probably keeping a secret and you stressing about maintaining that secret. Heck I’m even guilty of it, it’s what makes us human. Now Green Lanterns are no exception to the rule, I mean just look at the Guardians of The Universe as the perfect example of this. What exactly does this have to do with The Green Lantern Corps? Read further on to find out. Warning there will be spoilers. Now I’ve been pretty harsh on the Green/Yellow pairing because I wasn’t seeing the comradery between the two factions enough to justify the pairing. However there is always one exception to this rule and that’s the budding friendship between Arkillo and Guy. Now even though this new friendship hasn’t been explored to deeply, but this issue did a great job of moving it forward. Now being the cynic that I am, I’m sure that Venditti is setting up this partnership only to rip our hearts when Arkillo turns on Guy. It’s the oldest trick in the book, but if Venditti continues to make this pairing fun to read then the gut punch will work. 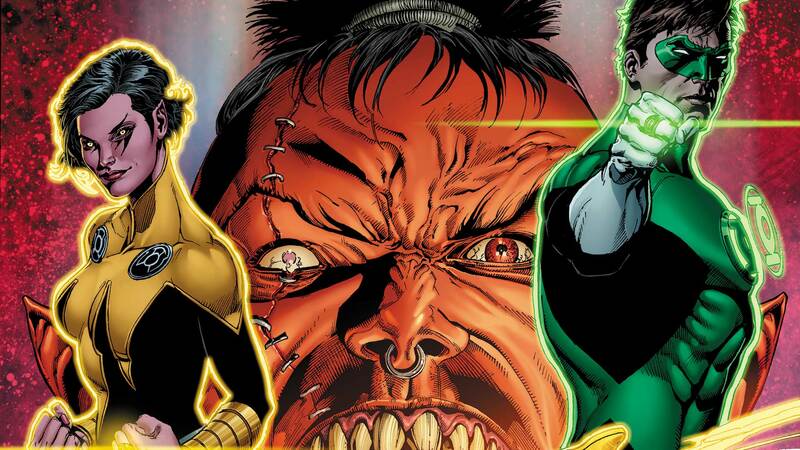 One of the weaker aspects of this story line happens to be Tomar-Tu’s “illness” and it’s ties to the accusation by Bolphunga that a Green Lantern murdered a Sinestro Corps member is really predictable. Now perhaps Venditti knew that readers would automatically connect the dots, so then it comes down to why Tomar-Tu would do something that would shatter the fragile alliance between Green/Yellow. If the purpose was actually to get readers to question Tomar’s motive then mission accomplished. I have to admit, I love how Venditti turned up the tension with the inter-cutting of panels for Guy and Hal only for them to reach the same conclusion. Even though the ending was obvious to me, it felt like a big reveal because of how the final scene was laid out. Ethan Van Sciver is a fantastic artists, I know this and you know this. We all admire the huge set pieces and the immense detail he put’s into every single panel. What Van Sciver does best is facial expressions and how it elevates the story to another level. My main focus is one the last few pages, just look at Hal and John’s distraught faces as they both realize that one of their friends has committed a horrendous crime. I could give you this scene without context and Van Sciver’s art tells you everything in a few panels. Amazing detail is one thing, but being able to tell a compelling story with facial expressions. Hal Jordan & The Green Lantern Corps #23 definitely is building up the tension, and while I’m not a fan of the Kyle/Natu love reunion I will admit that the involvement of their future child does bring an interesting twist to their potential relationship and after seeing Natu’s reaction that Kyle was hiding this fact from her only spells for some interesting drama in the next issue. Finally even though it was a small roll in the grander scheme within the context of the issue I loved seeing John being put into this situation. You can tell by his dialog and how Van Sciver draws his body that Bolphunga’s bluff ways heavy upon him as a leader. Really great issue overall.